This is the face of the real Concrete Donkey! 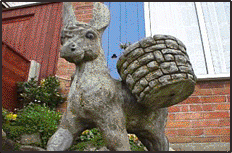 Andy Davidson, the loony who originally created the concept that we know and love as Worms, was as a young boy led to believe by his parents that this was a real Donkey, encased in concrete and held at their leisure in their garden located in Bournemouth, England. The Concrete Donkey is a most destructive garden ornament and a rare sight to behold in a game of Worms.